ItemPDP00613 - Wayside Cross, St Efflam, Brittany. ItemPDP00615 - Cedar Canim's house, Itedsu. ItemPDP00620 - Scaam mt peak. ItemPDP00621 - Woman weaving basket. ItemPDP00622 - Sun and Thunderbird, Alert Bay, BC. Gitsegukla is the current name for this Gitxsan village. Statements of responsibility: This unsigned and untitled work is in Emily Carr's hand and was in her studio at the time of her death, inventoried by the executors and stamped with the ink estate stamp. Attributions and conjectures: Title in place as early as 1961 and created by Flora Hamilton Burns for the Provincial Archives of BC. See Newcombe Collection catalogue, 1962. 1 watercolour: watercolour on two sheets of paper joined; 94.0 mc x 68.6 cm. 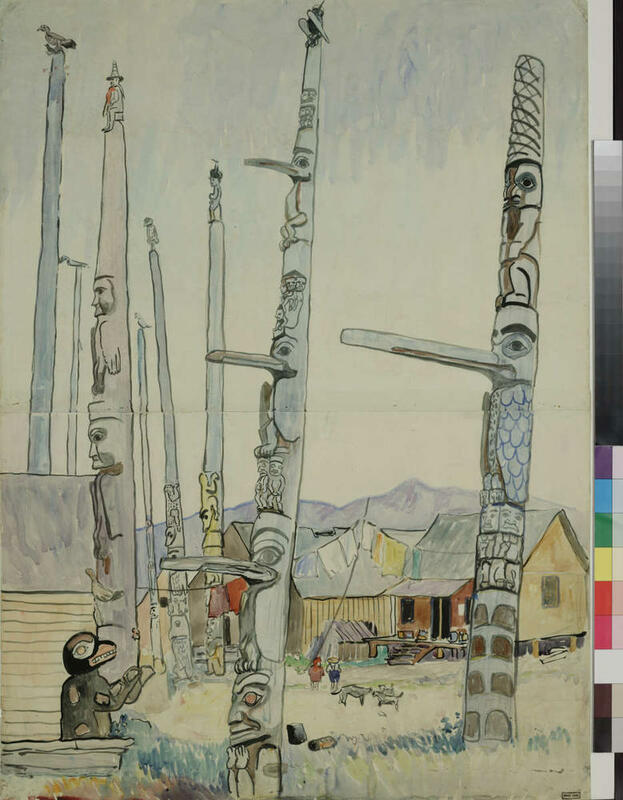 Purchased by William Arnold Newcombe from the estate of Emily Carr, 1945. One watercolour sketch on two pieces of joined paper. Purchased by the Government of British Columbia from the estate of W.A. Newcombe, 1961. Archives code(s): PDP00617; Previously numbered as NC 80. 1971-1972. Emily Carr: a centennial exhibition celebrating the one hundredth anniversary of her birth organized by the Vancouver Art Gallery travelling to the Montreal Museum of Fine Arts and the Royal Ontario Museum, Toronto. 1994. Structured Compositions, Art Gallery of Greater Victoria. 1998-1999. Emily Carr: Art & Process organized by the Vancouver Art Gallery travelling to the Art Gallery of Greater Victoria and the Kamloops Art Gallery. 2006-2008. Emily Carr: New Perspectives on a Canadian Icon collaboration between the Vancouver Art Gallery and the National Gallery of Canada, Ottawa travelling to the Art Gallery of Ontario, Toronto, the Montreal Museum of Fine Arts, and the Glenbow Museum, Calgary. 2011-2012. On the Edge of Nowhere. Art Gallery of Greater Victoria. Possible pencil annotation on verso, not investigated 2018.